I promise to use it only to send you Information. 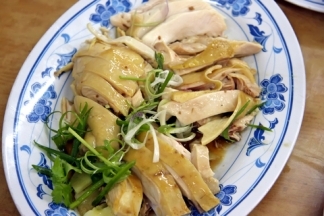 Steamed chicken or Ayam Kukus in Indonesian is a delicious chicken recipe with some tasteful ingredients to make it yummier and lovable by anybody. If you’re on diet this dish might be a solution because this low calorie recipe is diet friendly so you don't have to worry about your weight. Rub salt and pepper all over the chicken and set it aside for about 15 minutes. Stuff the chicken with the salted mustard leaves and put the chicken on a heat proof dish. Add the rest of the ingredients and the water. Steam over low heat for about 2 ½ - 3 hours, or until the chicken is tender.